Energy Finance Solutions (EFS) is proud to originate loans on behalf of the New York State Energy Research and Development Authority (NYSERDA). 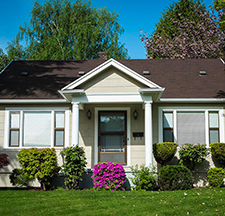 NYSERDA offers New York State residents two reduced-interest rate loan products to finance qualified residential energy efficiency improvements, as authorized by the Green Jobs-Green New York Act of 2009 and the Power NY Act of 2011. The two loan products are: 1) a Smart Energy Loan repaid in installments to NYSERDA's loan servicer; and 2) an On-bill Recovery Loan, repaid through an installment charge on your utility bill. For a detailed comparison of the two products, please see NYSERDA’s Home Performance Residential Loan Information sheet. For both loans, improvements eligible for financing include energy efficiency improvements to a 1- to 4-unit residential building that have been approved by NYSERDA and are installed by a participating BPI-accredited Home Performance with ENERGY STAR® contractor. For a list of Participating Contractors servicing your county, visit NYSERDA's Home Performance with ENERGY STAR website or call 1.866.NYSERDA. If you have questions about the BPI Accreditation, please contact the Building Performance Institute at 1.518.899.2727 or visit www.BPI.org. If you have questions about how to become a Participating Contractor in the Home Performance with ENERGY STAR Program, please contact Conservation Services Group (CSG) at 1.518.207.4500. Mortgage Payment History Mortgage has been paid on-time for the past 12 months and no payments more than 60 days late in the past 24 months. *DTI is a measure of existing debt payment obligations (mortgage, auto loan, student loan, credit card payments, etc.) as a percentage of income. **DTI is up to 100% for applicants who qualify for the Assisted Home Performance with ENERGY STAR 50% discount. This does not constitute a comprehensive list of loan underwriting guidelines. These standards are subject to change at NYSERDA's discretion. For the On-bill Recovery Loan, a title company under contract to NYSERDA will search public records to determine the ownership of the property. A $150 processing fee applies to all approved loans. This fee may be paid by check upon loan approval or maybe included in your loan. No fee is required to apply. Processing fees are assessed only for approved loans. Checks received as payment for processing fees will not be returned or refunded. The loan program is designed to encourage the installation of high efficiency measures to increase the energy efficiency of your home. All energy efficiency measures to be installed must meet minimum efficiency requirements to be eligible for financing. To obtain more information about the types of improvements that may be financed, view our Eligible Measures list. Before you select from one of the four options below please download the document, "How to Participate in GJGNY Residential Financing" for a step-by-step instruction guide designed to assist you through the loan process. The Residential Credit Application is not a contract for a loan, nor does it lock you into any commitment with a Participating Contractor. The credit application will allow EFS to proceed with your request for a loan to finance your energy efficiency improvement(s). The Credit Application allows you to select which loan option you prefer. Below are four (4) ways to apply for NYSERDA’s loan products. You may request an application packet by mail by calling 1.800.361.5663. Additional items may be requested based on your particular income and credit history. New York residents with a total household income equal to or lower than 80% of State or Area Median Income (whichever is greater), may be eligible to receive additional financial incentives through Assisted Home Performance with ENERGY STAR. Visit NYSERDA's website to obtain more information on Assisted Home Performance with ENERGY STAR. To apply, download the NYSERDA Residential Household Income Screening Application, and return one form per household with the required supporting documentation, to EFS.